A further 15 officers from the Spanish National Police were summoned to appear as witnesses in the Catalan independence trial on Thursday, to recount their experiences during the operation to stop the 2017 referendum. 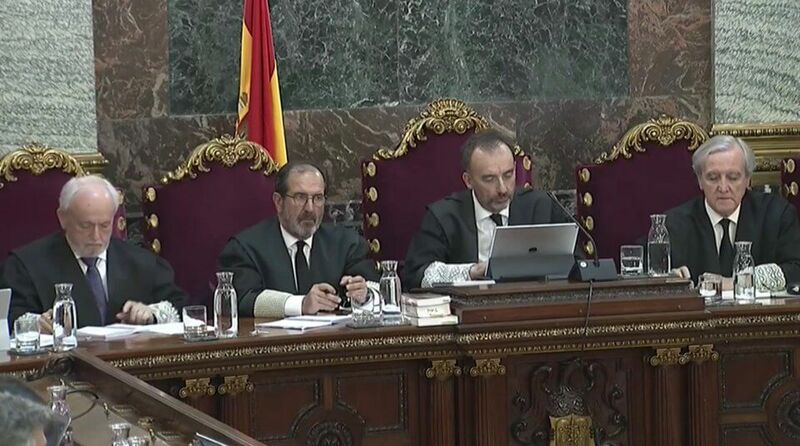 In total, 12 pro-independence leaders are in the dock in the Supreme Court in Madrid, including activists, the former parliament speaker, and members of the government that pushed for a referendum and declared independence despite Spain’s opposition. With the pro-independence leaders accused of violent rebellion, the testimonies of police officers who tried to close polling stations on referendum day could be crucial in determining whether voters were violent or remained peaceful, as the defence claims. One officer explained that he had been at the Más Casanovas polling station, where ‘about 500 people’ were. He said that when the police approached, a crowd gathered at the door with their arms linked, in an organised manner. He said that it took the police about 30 minutes to get into the polling station. He also said that he didn’t see any Catalan police (the Mossos d’Esquadra) helping the Spanish National Police, and that the Mossos seemed ‘static’. Another police inspector explained that his officers were called ‘terrorists’ and ‘fascists’ by the crowds outside the polling stations, and that people were chanting ‘occupying forces out’. Other officers also spoke about the resistance put up by crowds trying to stop the police entering the polling stations. People had formed ‘human walls’ and were ‘chanting’. It took police ‘over 20 minutes’ to enter and they had to ‘break the doors down’. People were also chanting ‘we will vote’ and ‘we are people of peace’, one officer said, in response to a question from the defence team. Some of the Supreme Court judges, presided over by Manuel Marchena. The witness also avoided saying that the referendum day voters were ‘violent’, but called them ‘irate’. ‘I remember they called me a torturer,’ he said. One officer explained that there were also children, elderly people, and also people with disabilities who stood between them and the entrance to the polling stations on 1 October 2017. Another officer said that voters ‘tried to make officers fall over’. Another said they received an ‘order’ to stop their efforts to close down polling stations at 3pm. Further officers spoke of voter violence, for example one officer claimed a colleague was punched in the eye and had to receive medical attention. Another police officer stated that they aided a man who had suffered a heart attack in Lleida on referendum day, while people were calling the officers ‘murderers’. ‘And the Catalan police didn’t collaborate with us during the operation,’ he added. The trial will resume on Monday at 10am.